What leads to the development of the General Comment? Looking at the explanation provided under the first paragraphs, there are three main reasons which convinced the Committee to develop a General Comment on article 6 of the African Children’s Charter. The first is related to the observations that the Committee has derived from State Party Reports on the status of the implementation of the right to birth registration. The Committee notes that the right to birth registration, unfortunately, is one of the rights that consistently appear not to be fully implemented by States Parties (Para 3 of the General Comment). This can be inferred from the concluding observations and recommendations to State Parties that have submitted their Reports including Kenya, Tanzania, Burkina Faso, Cameroon, Libya, Mali and Uganda. The second reason relates to the gravity of the problem of unregistered births in Africa. The Committee notes that currently millions of children go unregistered every year. According to the UN News Centre, a 2013 UNICEF Report reveals that 230 million children under the age of five had not had their birth registered, and the lowest rate of birth registration globally is in South Asia and in Sub-Saharan Africa. This results in children becoming vulnerable to all sorts of abuses such as recruitment into armed forces, sexual exploitation, being victims of child labour, human trafficking, early marriage, disinheritance, etc. The recognition of the strong link between lack of effective birth registration system and the increasing prevalence of statelessness is also another reason. The difficulty of realizing of children’s right to acquire nationality is ascribed to the lack of an effective and universal birth registration system. Even though the right to birth registration does not confer nationality by itself, the Committee notes that it is a proof of the nationality of the parents or the place of birth which are the grounds of acquiring nationality. It is considering these facts that the Committee decided to hold a day of general discussion on birth registration and the rights of the child during its 20th Ordinary Session which was held in November 2012. At the conclusion of this day, the Committee decided to develop a General Comment on Article 6 of the Charter, hence the General Comment was developed and adopted in April 2014. Addressing the challenges of statelessness among children requires an understanding of the causes of child statelessness. Statelessness among children is often a direct result of their parents’ stateless status. Most countries in the world observe a Jus Sanguinis, as opposed to Jus Soli, nationality regime, whereby citizenship is granted only to those children whose parents are recognized citizens. It is important to note that the applications of these systems could be the cause of statelessness in a situation where people change their place of residence. Statelessness could also be caused by nationality regimes that discriminate against women as many countries around the world prohibit women married to foreign spouses from passing on their nationality to their children. Situations of State succession might also contribute for statelessness among children. Children who belong to ethnic minorities are particularly vulnerable to statelessness when States break up and a new States are created. More importantly to the issue under consideration, statelessness among children could also be attributed to administrative practices such as excessive fees on birth registration, insufficient proof of documents and failure to register births. Therefore, the need for effective, free, universal birth registration should be in place so that children born in the territory of a State can acquire the nationality of that State where they would otherwise be stateless. 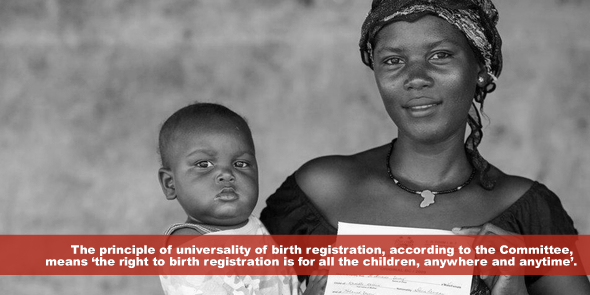 The principle of universality of birth registration, according to the Committee, means ‘the right to birth registration is for all the children, anywhere and anytime’. (Para 50 of the General Comment) The universality of birth registration particularly applies to address the challenges of registration of children born out of wedlock, children of minority groups, children with disability, children of refugee, asylum seeking or migrant families, children born to indigenous parents, and children of imprisoned mothers. Including advanced principles, the Committee in considerable detail discusses the principle of free and accessible birth registration. The Committee sets the principle of free birth registration by means of universal, accessible, simple, expeditious and effective registration procedures without discrimination of any kind. This principle includes cases where there is late registration of births. (Para 72 of the General Comment). The Committee also innovatively approaches the principle of free birth registration by introducing the concept of de facto limitations and obstacles to birth registration. In this regard, the Committee persuasively states that free birth registration does not simply mean abolition of the fee applicable to registering a child or the cost of obtaining the birth certificate. Free birth registration cannot be effective unless the associated costs are catered for by States parties. (Para 73 of the General Comment). The Committee further advances the interpretation of the rights to birth registration in relation to the principle of confidentiality. If registration is not made in a secure and confidential manner, it may expose a child to unnecessary risks since personal information may be misused, including for discriminatory purposes. In consideration of this fact, the Committee notes that States Parties must put in place a legal framework for protection of sensitive personal data that includes birth registration details and other vital statistical data. The General Comment’s approach to this element of birth registration is also unprecedented. Article 6 of the African Charter provides for registration of every child immediately after birth. The word ‘immediately’ is very vague and countries might interpret it in various ways, which could be detrimental to the rights to the child. The Committee, therefore, interprets ‘immediately’ to mean ‘as soon as possible, with due regard to cultural and local practice related to maternity and infant rearing’. (Para 79 of the General Comment) However, at the same time it should be construed narrowly and the word ‘immediately’ should be taken to mean that birth registration shall occur within a few days or weeks after birth and not months or years later. In cases where parents adduce disincentives to birth registration, including transport and associated costs, the Committee recommends that the impact of disincentives can be mitigated by the removal other fees associated with immediate registration. Furthermore, the Committee also recommends States parties to establish birth registration desks at all places where a birth certificate is required for a service, such as upon entry to school, or when registering for social security and poverty alleviation programmes. In conclusion, the General Comment includes principles and explanation which guide member States to establish a functioning, well managed, resourced, integrated, universal, free and accessible birth registration system with a view of, among other things, preventing statelessness. Ayalew obtained his LLB from Makelle University Ethiopia in 2006 and an LLM in Human Rights in Democratisation in Africa from the University of Pretoria, South Africa in 2011. He lectured law at the Makelle University and he was the editor in chief of Makelle University Law Journal. He is currently a legal researcher at the Secretariat of the ACERWC.